Rumors have been flying for the past few months that Sprint and HTC would update the Hero to the long awaited Android 2.1 Eclair today - March 26th, 2010. These rumors have been shattered today by conversations with multiple Sprint customer service reps and a posting of an internal memo by Phandroid announcing the new update date - April 9th, 2010. 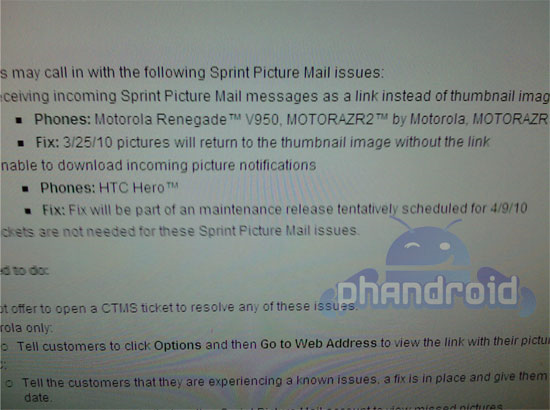 While the memo lists the 4/9/10 update as "maintenance", according to an alleged Sprint employee rkendle53 from the xda forums Sprint calls all updates "maintenance", even major ones. We are skeptical but hopeful at the same time - this 2.1 update is long overdue. So in the end we still know nothing and will be looking for any signs of official confirmations. Update: According to some tipsters, Sprint should be sending out a text message to all customers when the 2.1 update becomes available.